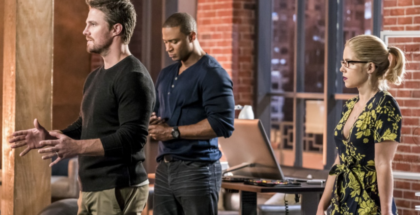 Cayden James makes his move and the teams remain divided in a solid episode of Arrow. 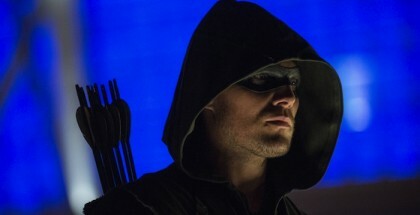 This episode of Arrow moves things forward in two significant ways: it establishes the ongoing dynamic of the two separate teams (Team Arrow and The Outsiders, as the press materials appear to have settled on calling them) and it finally reveals both Cayden James’ master plan and the motivation behind it. As such, it’s largely successful, even if certain elements of Cayden’s grand plan seem a little over-familiar. “We Fall” (following on from last week’s “Divided”) opens with the deaths of a few minor characters, one of whom turns out to be dear old Captain Pike, who’s been around since the early days. This seems like a bit of a waste, because the character had potential and had even popped up again recently, suggesting he had a larger part to play, but never mind. At any rate, he deserves better than the perfunctory electrocuted-in-a-lift ending he gets here. Maybe the actor got a better offer on another show? Anyway, various people die in Star City through electrical malfunctions (traffic lights, elevators) and the like and it turns out that Big Bad Cayden James is responsible. He shows up in Oliver’s office and demands that he wire a nightly 10 million dollars into an offshore account or the killings will continue. 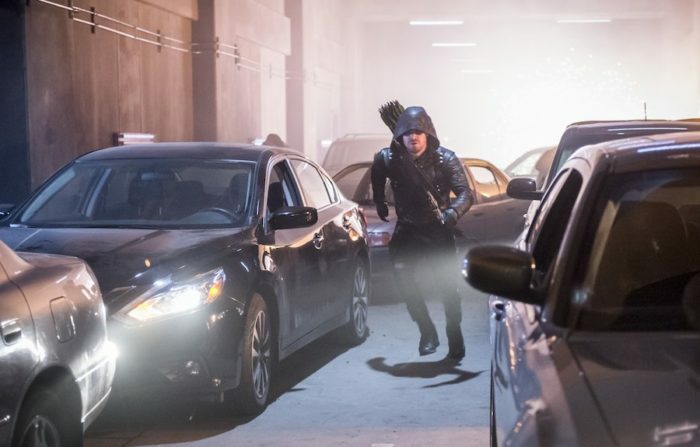 His intention is to bankrupt the city Oliver loves, because his son was apparently murdered by a stray arrow fired by the Green Arrow a year ago. Felicity and Oliver realise that someone is framing Oliver because he wasn’t in Star City a year ago – he was in Edge City, recruiting Dinah Drake. That raises the possibility of a larger villain pulling the strings, manipulating Cayden into doing his bidding. Who could it be? It can’t be Damian Darhk – he’s way too busy over on Legends of Tomorrow. And Malcolm’s dead, so that leaves… Ra’s al-Ghul? Maybe not. 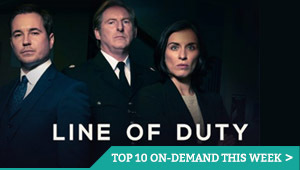 Anyway, with Pike dead, Quentin automatically becomes the Police Captain again (not quite sure how that works, but let’s go with it, because he’ll still be working closely with Thea and that’s the important thing). There’s an odd little moment between them where he brings her coffee, which falls weirdly flat, but we’ll take our Quentin / Thea interactions where we get them and we appreciate that the episode bothered to put one in, no matter how small. So, with Cayden’s plan in full swing, Team Arrow decide that it might be a good idea to share information with The Outsiders. They agree, which is just as well, because Cayden has moved on to crashing planes. Meanwhile, Curtis secretly meets up with Vincent / Vigilante (well, tracks him and tries to ambush him, but it turns out Vigilante has lured him into the meeting), and Vigilante reveals that he’s actually a double agent and is secretly working to bring down Cayden from the inside. Curtis is understandably sceptical, but Vigilante gives him Cayden’s next target. Curtis duly checks in with Felicity to confirm the information and both teams realise that Cayden is pulling the old Dark Knight Rises move and attempting to seal off every entrance and exit to the city. Which means sealing off a tunnel that Oliver’s son William just happens to be heading into on a field trip. Ruh roh! Oliver and Diggle arrive in time to save William from the gas main explosion in the tunnel and there’s a cool bit where William proves his own heroism by leading his classmates to safety, even the school bully. Unfortunately, this is the way that William finds out his dad is back in the Green Arrow business. William: annoyed. Meanwhile, The Outsiders head off to stop Cayden’s actual next target: a runaway train. Dinah manages to stop the train with her canary cry, which is almost certainly the coolest single Arrow moment we’ve had all season. The creative team are really having fun with the sonic screams this season, what with this and Laurel’s deadly canary kisses last week. Alena pops up to help out Felicity and tells them that Cayden James received a package from Corto Maltese (remember Corto Maltese?) last year. The team speculate that that was probably the evidence used to frame Oliver. Is that a clue to the real Big Bad? Is it actually Malcolm after all? Oh, the suspense. With the clock ticking till Cayden’s next attack, Oliver calls a press conference, calls out Cayden as the man behind the attacks and says that Star City refuses to negotiate with terrorists and everyone should make their way to the tech-free safe zones they’ve set up around the city. Cayden seems unfazed, like this was part of the plan all along. Yeah, right. Anyway, Vigilante has proved his worth, and both teams are now fully aware of his double agent status. Vigilante sends The Outsiders another message about a new target (via Curtis’ T-spheres, which continue to be used in fun new ways) and this time the two teams agree to act together, just like old times. A massive fight scene ensues, but in an inspired and unusual touch (at least for this show), it’s overlaid with a touching voiceover from Felicity, explaining to William how and why his father is a hero. They’re watching the action on CCTV, so she’s also able to predict Oliver’s moves as he makes them, which makes for a nice twist on the action and is a pretty cool moment all on its own. The capper to the fight scene is that Vigilante risks blowing his own cover to save Rene’s life, so it looks like he’s telling the truth for the moment, at least. Unfortunately, despite their victories, Team Arrow are still no closer to stopping Cayden and when Alena fails to provide the evidence they need, Oliver is forced to acquiesce to his demands and orders Thea to wire Cayden the $10 million. He also knocks out all communication in Star City, which seems a little counter-productive, but that’s supervillains for you. Back at the house, William tells Oliver he’s fine with him being the Green Arrow again and he doesn’t even mind if he gets killed so much any more, because, let’s face it, Felicity is better at helping him with his homework anyway. The cheeky young scamp. The only other subplot this week is Diggle’s growing annoyance that even though his hand is better and he’s well enough to be back in the field, Oliver still hasn’t reinstated him as the Green Arrow. It seems like this will be Important For Later. All in all, this us a pretty solid episode, with the two team dynamics actually settling into an enjoyable groove, now that they’ve stopped bickering about the reasons for the split in the first place. If there’s a problem, it’s only that Cayden’s motivations seem a little over-familiar, given that the exact same thing (death of a loved one at Oliver’s hand) motivated Prometheus last season. Ah well. Tune in next time for a Vigilante-centric episode! – The showrunners are clearly aware of the joy that Michael Emerson’s performance is bringing to Lost fans. This week, they even throw in a little Lost Easter Egg – when he arrives at Oliver’s office, Cayden gives the name Ben Gale, an amalgamation of the two names he used on Lost, Ben Linus and Henry Gale. – Oliver getting annoyed at William’s Flash backpack is a nice throwaway moment, but they could have done a little bit more with it, as it doesn’t quite get the laugh it deserves. – Quentin might not have a lot to do this week but he still gets one of the best lines, muttering, “Just when I thought I was out…” (a Godfather reference) when he gets his Police Captain job back. Photo: 2017 Warner Bros. Entertainment, Inc.